Dr. Hassink has focused her career on advocacy for children and families as a clinician, researcher, writer and speaker. Dr. Hassink has testified before Congress on childhood obesity, food insecurity and hunger focusing on supporting the foundations of child health. She is a past president of the American Academy of Pediatrics, an organization of 66,000 pediatricians with a national and global agenda for children. Dr. Hassink served as the state AAP chapter president for Delaware, and the District Chair for the Mid Atlantic states on the Board of Directors of the national AAP. She is the Director of the AAP Institute for Healthy Childhood Weight which is focused on translating research into practice for pediatric health care providers, families and children and advancing the field of pediatric obesity. Dr. Hassink began the weight management clinic at Nemours/AI DuPont Children’s Hospital in 1988. 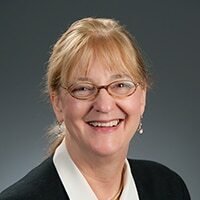 She has collaborated in basic research efforts to identify pathophysiologic mechanisms of obesity, centering on the role of leptin, and has lectured widely in the field of pediatric obesity. In addition, she has authored A Parent’s Guide to Childhood Obesity, Pediatric Obesity: Prevention, Intervention, and Treatment Strategies for Primary Care, and Clinical Guide to Pediatric Weight Management. Dr. Hassink dedicates a significant portion of her time to advocacy and policy development on obesity prevention and treatment. She has served on the IOM committee on Accelerating Progress on Obesity Prevention and was an author on the Expert Recommendations for Obesity. Dr. Hassink also holds an MS in Pastoral Care and Counseling.